Codie LaGrange, a senior conservation management major, is among the students who have benefited from working at the Pleggenkuhle Prairie near Hawkeye, Iowa. LaGrange has already attained employment as a lab technician/assistant coordinator at Kirkwood Community College in Cedar Rapids, Iowa. For nearly two decades, Upper Iowa University science faculty and students have conducted prescribed burns and research projects to preserve one of the few remaining virgin prairie ecosystems in northeast Iowa. Located northwest of Hawkeye, UIU’s Pleggenkuhle Prairie serves as an outdoor classroom to the University’s Ecology, Wildlife Management, and BIO 496 (Senior Project) students. General Biology majors, the UIU Science and Environment Club, and Conservation Management, Environmental Science and Life Science Plant Emphasis student volunteers also continue to be involved. UIU Professor of Science/Robert L. Fox Chair of Science Dr. Scott Figdore and Associate Professor of Biology Dr. Jennifer Stoffel received a $1,034 Iowa Native Plant Society Grant to provide students with funding to travel to and conduct invasive and woody species management at Pleggenkuhle Prairie. The grant also helped provide funding for additional protective equipment for students. Codie LaGrange, a senior conservation management major, is among the students who have benefited from working at the Pleggenkuhle Prairie. LaGrange has already attained employment as a lab technician/assistant coordinator at Kirkwood Community College in Cedar Rapids, Iowa. In addition, the Lone Tree, Iowa, native expressed his appreciation for the opportunity to work alongside UIU Associate Professor of Biology Dr. Jennifer Stoffel and Professor of Science/Robert L. Fox Chair of Science Dr. Scott Figdore. He credits the hands-on experiences he gained while in the field with the faculty members for helping him attain the skills required for employment. “The amount of knowledge I gained surveying and identifying plants with Dr. Figdore is incredible,” LaGrange explained. “It is a great feeling to have someone ask you the name of a type of grass or flower and you can quickly reply with an answer. This was definitely a lifelong learning experience. Codie LaGrange, a UIU senior conservation management major, is especially grateful for the real-life land management skills that he has obtained at UIU’s Pleggenkuhle Prairie. 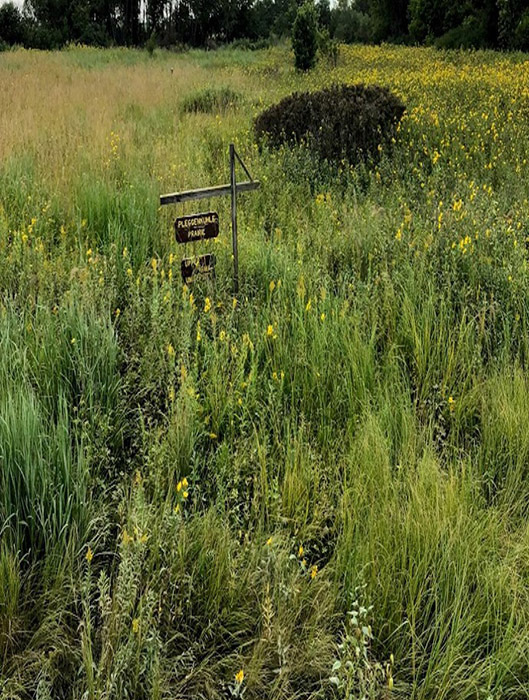 Figdore and Stoffel received a $1,034 Iowa Native Plant Society (INPS) Grant to provide students with funding to travel to and conduct invasive and woody species management at Pleggenkuhle Prairie, while under the faculty members’ supervision. The grant also helped provide funding for additional personal protective equipment for students. 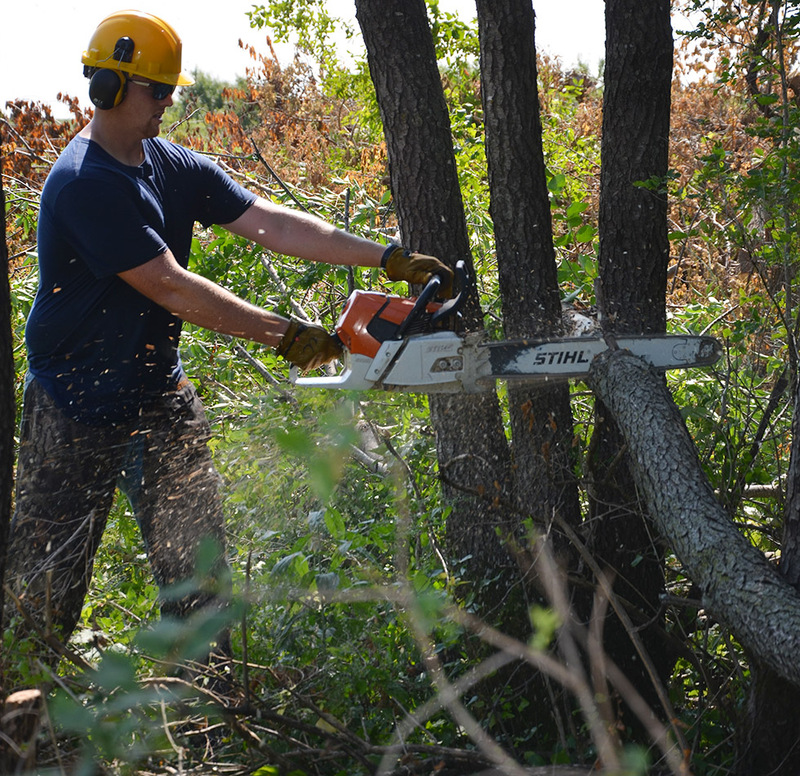 Stoffel noted that LaGrange’s chainsaw experience was especially valuable in helping to manage the property. Joshua Crosbie, a senior from Fayette, Iowa, and Ryan Roth, a senior from Cedar Falls, Iowa, were instrumental in the management of the property as well. Meanwhile, UIU senior Kaitlin Teff of Ossian, Iowa, has been a key contributor to documenting approximately 90 plant species at the three-acre site. Junior Nick Houg of Fayette, Iowa, who is similarly passionate about land management, also volunteered at the site several times. UIU Associate Professor of Biology Dr. Jennifer Stoffel (far left) and Professor of Science/Robert L. Fox Chair of Science Dr. Scott Figdore (second from right) are pictured with Kirkwood Community College transfers (l-r) Ryan Roth, Nick Houg, Joshua Crosbie and Codie LaGrange who have been actively involved in the management of the Pleggenkuhle Prairie. LaGrange actually earned an associate degree in parks and natural resources at Kirkwood Community College before transferring to Upper Iowa. The Lone Tree, Iowa, native noted most of his Kirkwood credits easily transferred to UIU, which allowed him to achieve his desired degree in two more years of education.